We spent this past weekend hanging out at our house in town, watching movies with the boys and of course creating a little of this and that in the kitchen. Sunday came around and Scott was under the weather. While he rested in bed and binge-watched his new favorite series Bates Motel, the boys and myself continued our weekend of movie watching, homework, and playing in the kitchen. Wanting to help Scott feel better, we came across this idea and decided to give it a go. For much of my life, it seems that I have done a lot of things the hard way. Maybe because I’m not always that creative and maybe because I am often a little slow on the uptake, this habit seems to have followed me in the kitchen as well. Good food doesn’t have to be complicated. Scott is much better at creating simple recipes than I am and I am always amazed at the delicious his concoctions he creates with the simplest of ingredients and techniques. A good example of this is his Slow Cooker Creamy Chicken. Perhaps with this recipe, I am starting to catch on. Lipton soup mix is used in dips, it’s used in burgers, it’s used in all sorts of things. Why not use it in chicken soup? Real chicken soup. That’ what I did with this recipe. It is fast, easy and convenient. Best of all, it’s the only thing Scott would eat after a long day of sickness, fever, and not being able to stomach anything else. When I saw the empty bowl next to his recliner in our living room, I knew this was the right recipe at the right time. Give it a try, it is wonderful stuff. More Delicious Soup Recipes Here! Place olive oil in large stock pot and heat over medium high temperature. Place onion, celery, and carrots in pot and stir and saute until onion is soft and translucent. Cook for five more minutes over low temperature. 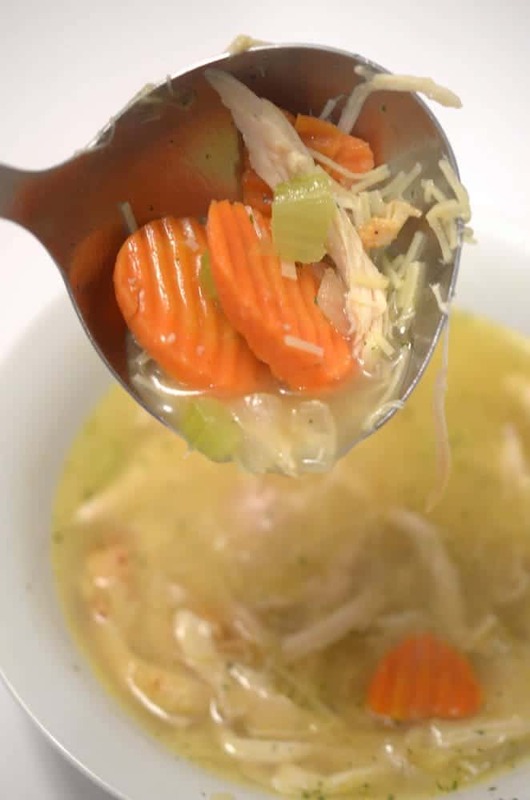 For added flavor, some of the water may be substituted with low-sodium chicken broth. There is nothing more comforting than homemade chicken noodle soup- this looks like everything I need right now! There is nothing like homemade chicken noodle soup to feel better. It’s my go to when someone is feeling under the weather in my home. This recipe looks easy to make in no time at all. 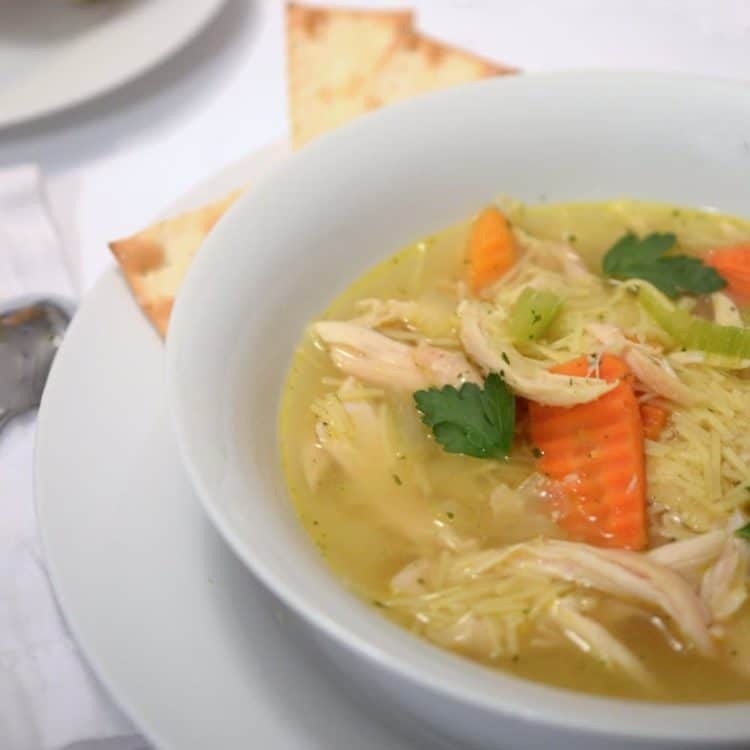 There is absolutely nothing better than homemade chicken soup — especially when you’re under the weather! Hope Scott feels better! 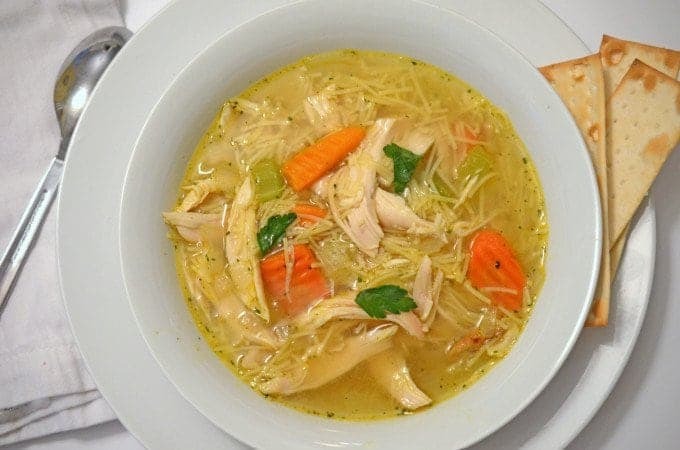 There is nothing quite like homemade chicken noodle soup! The shortcuts of using soup mix and rotisserie chicken are so helpful – especially when you are the one who is sick and it’s still up to you to do the cooking! 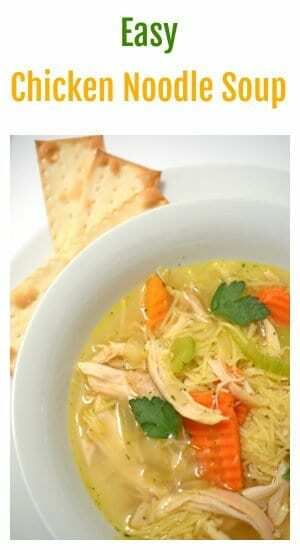 I’ve always had a soft spot for Lipton Chicken Noodle Soup (comfort food from my childhood!) and this is a great way to take it to a whole new level of deliciousness! 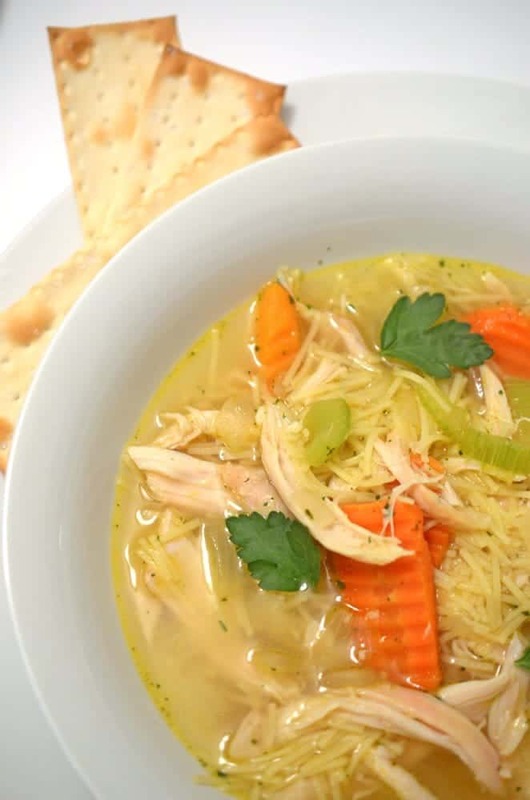 Your Easy Chicken Noodle Soup looks warming and super tasty too! 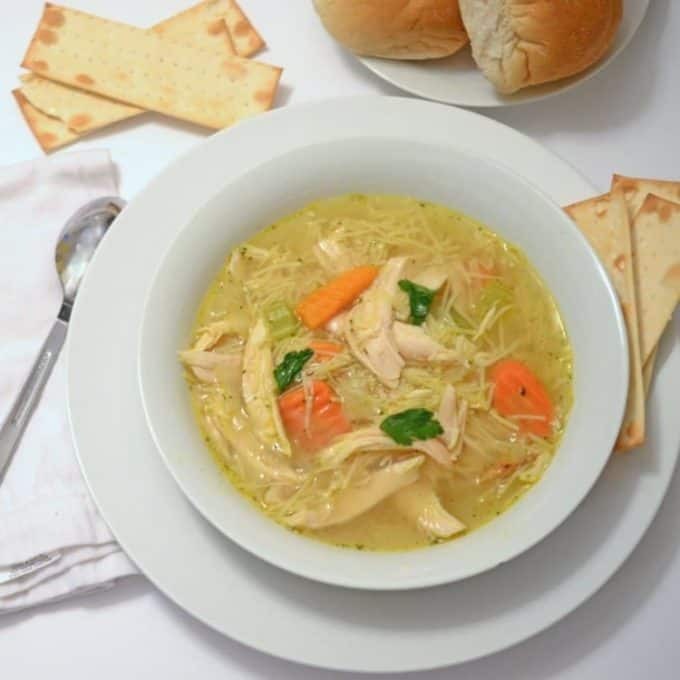 I love a good chicken soup any day, but especially when I am feeling under the weather. It’s classic comfort food and easy is always good! I’m glad you shared this one with us at #FoodieFriDIY…it’s such a cold damp day here! Pinning and sharing! Happy Friday! Nothing more comforting, wonderful recipe! Wonderful soup recipe. Quick and easy too. My nose is running as I type this. Could you send a bowl over? Chicken soup is my weakness. I love the flavor a rotisserie chicken gives soup. Lovely recipe. This is what I want right now Dan. Love this simple and delicious soup recipe. Great idea, Dan. This yummy soup makes me look forward to my next upset stomach:-) Seriously – I love simple, delicious recipes and yours looks and sounds perfect. Thanks!